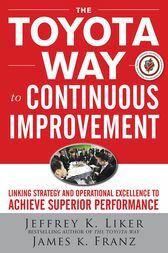 Jeffrey K. Liker, author of the bestselling The Toyota Way, is professor of industrial and operations engineering at the University of Michigan. His most recent book, Toyota Under Fire, chronicles Toyota’s response to the recession and recall crisis. James K. Franz has more than 24 years of manufacturing experience and learned “lean” as a Toyota production engineer in the United States and Japan. He has worked for and consulted with various organizations, including Ford, Bosch, the U.S. Air Force, Exxon Mobil, AMCOR, Hertz, and Applied Materials. He also teaches for the University of Michigan’s Center for Professional Development’s Lean Certification course.